Describe the electric and magnetic waves as they move out from a source, such as an AC generator. Explain the mathematical relationship between the magnetic field strength and the electrical field strength. Calculate the maximum strength of the magnetic field in an electromagnetic wave, given the maximum electric field strength. We can get a good understanding of electromagnetic waves (EM) by considering how they are produced. Whenever a current varies, associated electric and magnetic fields vary, moving out from the source like waves. Perhaps the easiest situation to visualize is a varying current in a long straight wire, produced by an AC generator at its center, as illustrated in Figure 1. Figure 1. This long straight gray wire with an AC generator at its center becomes a broadcast antenna for electromagnetic waves. Shown here are the charge distributions at four different times. The electric field (E) propagates away from the antenna at the speed of light, forming part of an electromagnetic wave. The electric field ( ) shown surrounding the wire is produced by the charge distribution on the wire. Both the and the charge distribution vary as the current changes. The changing field propagates outward at the speed of light. There is an associated magnetic field ( ) which propagates outward as well (see Figure 2). The electric and magnetic fields are closely related and propagate as an electromagnetic wave. This is what happens in broadcast antennae such as those in radio and TV stations. Closer examination of the one complete cycle shown in Figure 1 reveals the periodic nature of the generator-driven charges oscillating up and down in the antenna and the electric field produced. At time , there is the maximum separation of charge, with negative charges at the top and positive charges at the bottom, producing the maximum magnitude of the electric field (or -field) in the upward direction. One-fourth of a cycle later, there is no charge separation and the field next to the antenna is zero, while the maximum -field has moved away at speed . 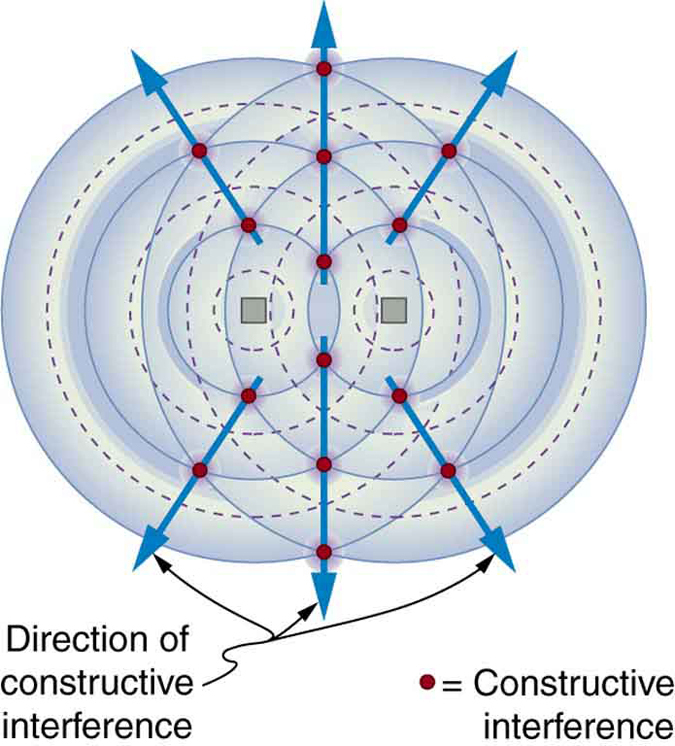 Following Ampere’s law, current in the antenna produces a magnetic field, as shown in Figure 2. The relationship between and is shown at one instant in Figure 2 (a). As the current varies, the magnetic field varies in magnitude and direction. Figure 2. 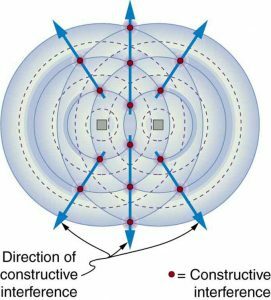 (a) The current in the antenna produces the circular magnetic field lines. The current (I) produces the separation of charge along the wire, which in turn creates the electric field as shown. (b) The electric and magnetic fields (E and B) near the wire are perpendicular; they are shown here for one point in space. (c) The magnetic field varies with current and propagates away from the antenna at the speed of light. The magnetic field lines also propagate away from the antenna at the speed of light, forming the other part of the electromagnetic wave, as seen in Figure 2 (b). 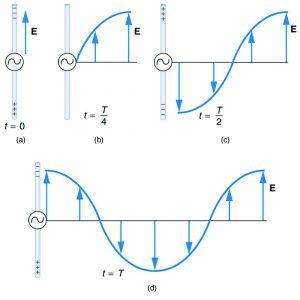 The magnetic part of the wave has the same period and wavelength as the electric part, since they are both produced by the same movement and separation of charges in the antenna. 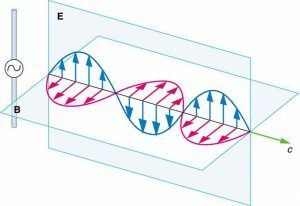 The electric and magnetic waves are shown together at one instant in time in Figure 3. The electric and magnetic fields produced by a long straight wire antenna are exactly in phase. Note that they are perpendicular to one another and to the direction of propagation, making this a transverse wave. Figure 3. A part of the electromagnetic wave sent out from the antenna at one instant in time. The electric and magnetic fields (E and B) are in phase, and they are perpendicular to one another and the direction of propagation. For clarity, the waves are shown only along one direction, but they propagate out in other directions too. Electromagnetic waves carry energy away from their source, similar to a sound wave carrying energy away from a standing wave on a guitar string. An antenna for receiving EM signals works in reverse. And like antennas that produce EM waves, receiver antennas are specially designed to resonate at particular frequencies. There is a relationship between the – and -field strengths in an electromagnetic wave. This can be understood by again considering the antenna just described. The stronger the -field created by a separation of charge, the greater the current and, hence, the greater the -field created. is the ratio of -field strength to -field strength in any electromagnetic wave. This is true at all times and at all locations in space. A simple and elegant result. What is the maximum strength of the -field in an electromagnetic wave that has a maximum -field strength of ? Where T stands for Tesla, a measure of magnetic field strength. The -field strength is less than a tenth of the Earth’s admittedly weak magnetic field. This means that a relatively strong electric field of 1000 V/m is accompanied by a relatively weak magnetic field. Note that as this wave spreads out, say with distance from an antenna, its field strengths become progressively weaker. The result of this example is consistent with the statement made in the module Chapter 24.1 Maxwell’s Equations: Electromagnetic Waves Predicted and Observed that changing electric fields create relatively weak magnetic fields. They can be detected in electromagnetic waves, however, by taking advantage of the phenomenon of resonance, as Hertz did. A system with the same natural frequency as the electromagnetic wave can be made to oscillate. All radio and TV receivers use this principle to pick up and then amplify weak electromagnetic waves, while rejecting all others not at their resonant frequency. For your TV or radio at home, identify the antenna, and sketch its shape. If you don’t have cable, you might have an outdoor or indoor TV antenna. Estimate its size. If the TV signal is between 60 and 216 MHz for basic channels, then what is the wavelength of those EM waves? Try tuning the radio and note the small range of frequencies at which a reasonable signal for that station is received. (This is easier with digital readout.) If you have a car with a radio and extendable antenna, note the quality of reception as the length of the antenna is changed. Electromagnetic waves are created by oscillating charges (which radiate whenever accelerated) and have the same frequency as the oscillation. Since the electric and magnetic fields in most electromagnetic waves are perpendicular to the direction in which the wave moves, it is ordinarily a transverse wave. which implies that the magnetic field is very weak relative to the electric field . 1: The direction of the electric field shown in each part of Figure 1 is that produced by the charge distribution in the wire. Justify the direction shown in each part, using the Coulomb force law and the definition of , where is a positive test charge. 2: Is the direction of the magnetic field shown in Figure 2 (a) consistent with the right-hand rule for current (RHR-2) in the direction shown in the figure? 3: Why is the direction of the current shown in each part of Figure 2 opposite to the electric field produced by the wire’s charge separation? 4: In which situation shown in Figure 5 will the electromagnetic wave be more successful in inducing a current in the wire? Explain. Figure 5. Electrmagnetic waves approaching long straight wires. 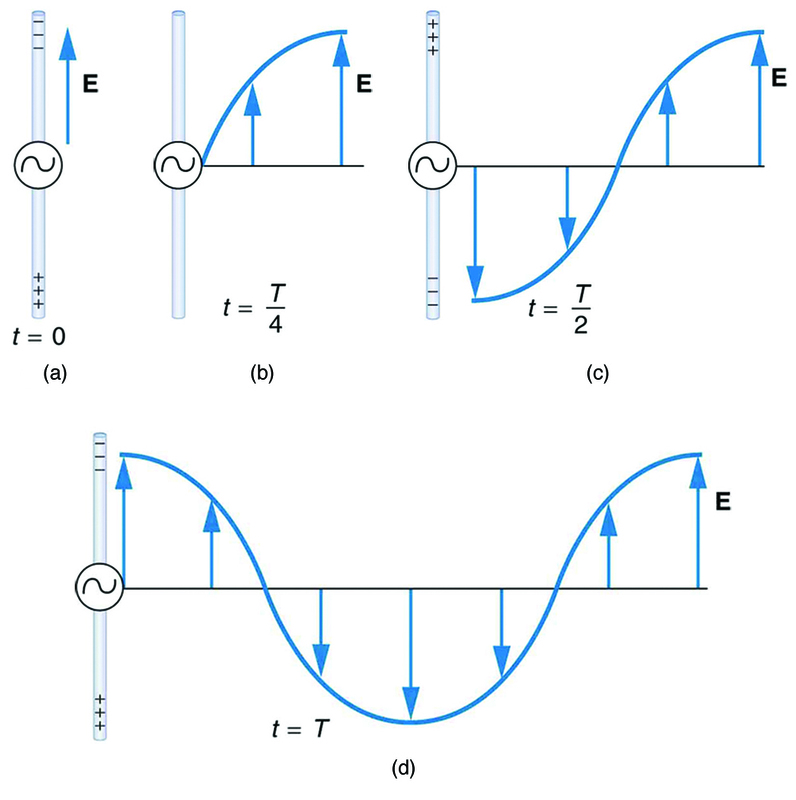 5: In which situation shown in Figure 6 will the electromagnetic wave be more successful in inducing a current in the loop? Explain. Figure 6. Electromagnetic waves approaching a wire loop. 7: Under what conditions might wires in a DC circuit emit electromagnetic waves? 8: Give an example of interference of electromagnetic waves. 9: Figure 7 shows the interference pattern of two radio antennas broadcasting the same signal. Explain how this is analogous to the interference pattern for sound produced by two speakers. Could this be used to make a directional antenna system that broadcasts preferentially in certain directions? Explain. Figure 7. An overhead view of two radio broadcast antennas sending the same signal, and the interference pattern they produce. 10: Can an antenna be any length? Explain your answer. 1: What is the maximum electric field strength in an electromagnetic wave that has a maximum magnetic field strength of (about 10 times the Earth’s)? 2: The maximum magnetic field strength of an electromagnetic field is . Calculate the maximum electric field strength if the wave is traveling in a medium in which the speed of the wave is . 3: Verify the units obtained for magnetic field strength in Example 1 (using the equation ) are in fact teslas (T). 24.2 Production of Electromagnetic Waves by OpenStax is licensed under a Creative Commons Attribution 4.0 International License, except where otherwise noted.